THE SLUGGY STORE IS BACK! BOOK 19 "BROKEN" IS AVAILABLE AT LAST! It's still amazing, but not surprising to me, how long it takes me to make things happen. But book 19 is finally complete, printed, and the Defenders copies are shipped. I have a good supply of Book 19s them on hand for you to purchase, and it will also become available at IndyPlanet sometime in May. I'm just going to repeat here what I put in the Sluggy News Section: I HAVE BOOK 19 IN MY HANDS, ALL 218 PAGES OF IT! Sluggy Freelance Book 19 BROKEN is one of my favorite books yet. It's as dark as anything I've ever written. No, it is the darkest thing I've ever written. But it's beautiful. The colors, the layouts, everything. The silly unassuming nine page bonus story that occurs early in the book "Revelation of the Scyllakracken" hides a deeper understanding and foreshadowing of later events in the book. It was the hardest task in putting this book together, finding a bonus story that 'fit' the tone of the book overall. Achievement Unlocked! I'm very proud of every aspect of this book. I hope you will get this in your hand, find a cozy corner, and immerse yourself once again in the pain and darkness. Also the Bun-bun vs. Oasis knife-fight. THE FATE OF MEGATOME 02 "LITTLE EVILS": Sluggy Freelance Megatome 02 has sold out! HARDCOVERS STILL AVAILABLE! But I have decided to reprint it as is*, as opposed to splitting it back into books 4, 5, & 6. Downside is it will be much more expensive as its more expensive to print. The upside is, it's still cheaper than if you were to buy 4, 5, and 6 separately. PLUS there's next to no additional work to put into layout. I'd rather spend book layout time on Book 20 than on redoing books 4, 5, & 6! *When I say "as is" the one thing I'm definitely changing is the spine of the book, so it shows "4-6" (indicating Books 4 through 6) instead of "M 2" (for Megatome 2). It was a required publishing compromise when Megatome 02 was first created. The new spine will finally perfectly match the other spines. Yay on that! But thats the only change I can think of. THE HARDCOVER EDITION ALREADY HAS THAT SPINE CORRECTION. Look for the shiny new Megatome 02 to be in the Sluggy Store in the summer! And that's all that's new! SLUGGY STORE CLOSINGS: Since most of what I sell these days are books, and most of the books you can get from me on demand at IndyPlanet, this store will go offline now and again, normally between new book releases. Sometimes for months on end! 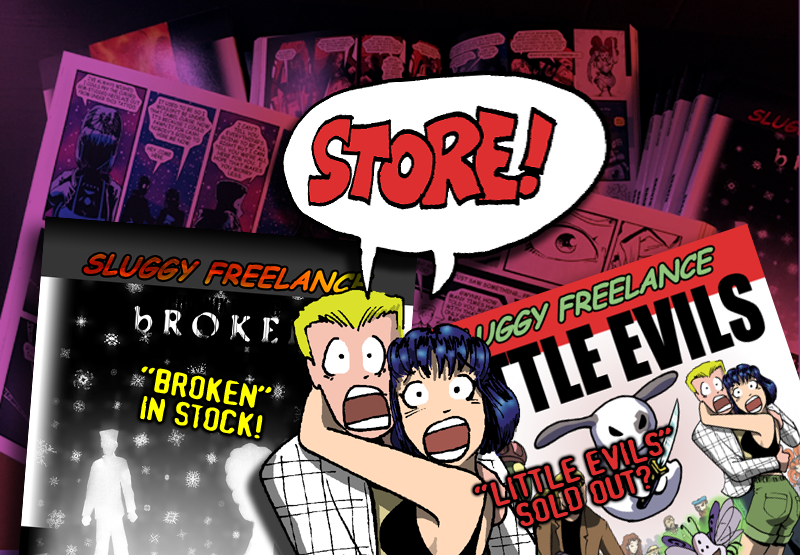 I'll try to keep everyone up to date on the main Sluggy page if a prolonged Sluggy Store closure is on the horizon, so keep an eye out there as you check out the new comics. LOG IN! : You can log in to the store with the same username and password you use on the forums and the main page! In fact if you logged in before coming here, you're already logged into the store! Neat! SHIPPING SCHEDULE: Life may cause unexpected delays, but in general, orders received by any given Friday will be packed up the next Monday and go out soon thereafter. As everything ships USPS Priority Mail, it shouldn't be long before it reaches your door! And that's it! Happy shopping, and thanks for supporting Sluggy Freelance for the first 20 years and INTO THE FUTURE!!! !